In a conference call Thursday, RIM co-executive Mike Lazaridis unveiled company plans for a massive PlayBook 2.0 software update to be demonstrated at the Blackberry DevCon conference in October. The update would include the all-important and much demanded native e-mail client, calendar support and a fully functional Android App Player. Additional features and updates are also expected, such as the BlackBerry Balance platform, which should allow the user to more easily separate business/work content from personal or home content. The software update confirms earlier rumors of a possible large PlayBook update coming later in the year to spur PlayBook sales. A large update all at once instead of multiple smaller ones can boost publicity of the RIM tablet, something that the device is in dire need of. As for the rest of the earnings call, the Q2 fiscal reports were disappointing to say the least. As expected by a number of analysts, PlayBook shipments have been low, even lower than what some analysts have predicted. “We had cut our PlayBook numbers, and they still came in below that,” said analyst Mike Walkley of Canaccord. 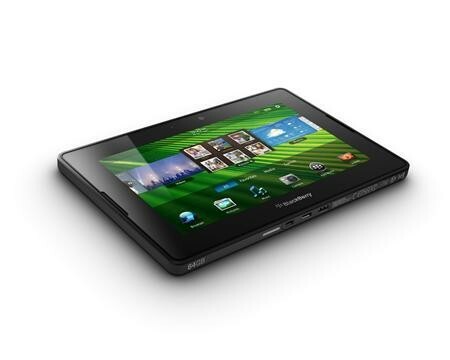 RIM was only able to ship 200,000 PlayBook units during its second quarter period. Still, RIM is optimistic about its upcoming Q3 results. The large PlayBook 2.0 update and additional marketing of the device to both consumers and enterprise users should “generate an increase in demand and sell-through in Q3 and into the holiday season,” Lazaridis believes. Final Q2 2011 results came in at a net income of $329 million, about 41 percent lower than the same quarter a year ago. Overall revenue was also 10 percent lower at $4.17 billion, or about $300 million less than what analysts have been expecting, according to Market Watch. As a result, RIM shares have taken a plunge today. The company will certainly have to impress for its next quarter to get back on its feet.